Galil Zweet Berries- Okay, these were so strange and yet so fruity. Turns out they're made with real fruit juice and that must be why the raspberry flavor was so prevalent. The outside of these gummy candies have little, not-gummy beads. They're hard and make the gumdrops look like raspberries and blackberries. It was a little weird to eat something gummy yet crunchy at the same time. 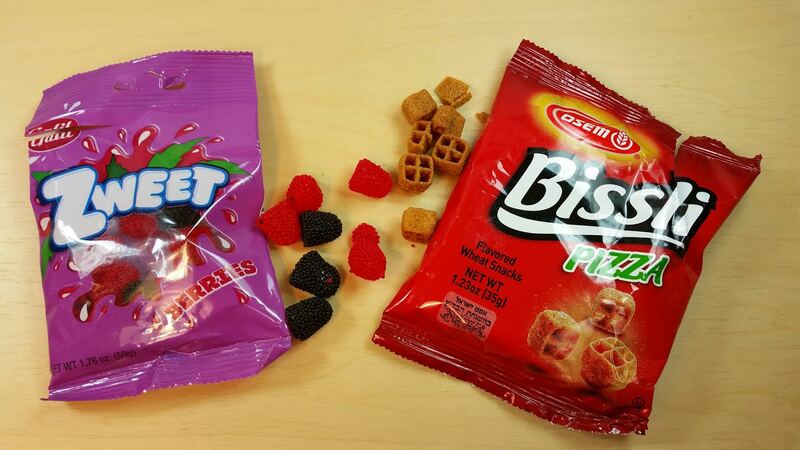 Osem Bissli Pizza- This is a wheat snack from Israel. These were pizza flavored and addicting. I was pretty sad when I got to the end of the bag. They look like little waffles but they don't taste like it! Yum! 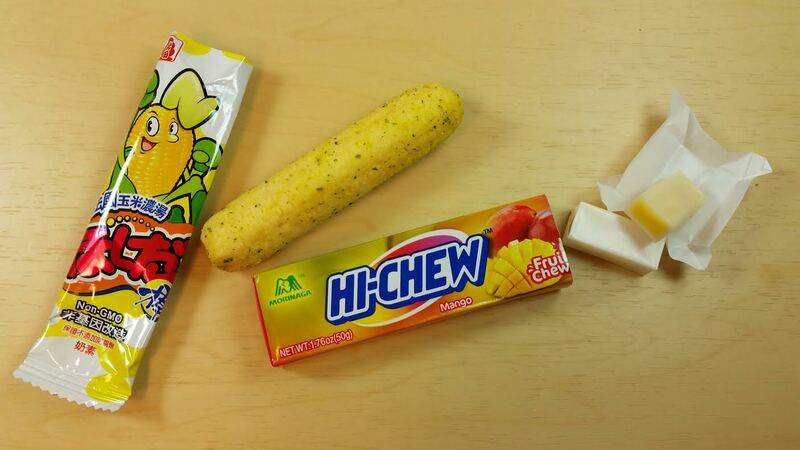 Hi-Chew Mango Fruit Chews- My favorite Japanese snack ever. Ever, ever. When these fell out of the envelope I was immediately biased. I adore Hi-Chews but I never get them. Probably because I never see them. But the mango flavor... tastes like mango. Actual mango. And I got an entire package in my MunchPak. Coris Whistle Candy with Bonus- Okay, so my niece and nephew are in town. They're two and four, respectively. These are candies you hold with your lips and if you breath through the hole, they whistle! What four year old isn't going to love that? These taste like strawberry and while they look like they might be hard like SweetTarts, they're not. They're pretty soft on that level. 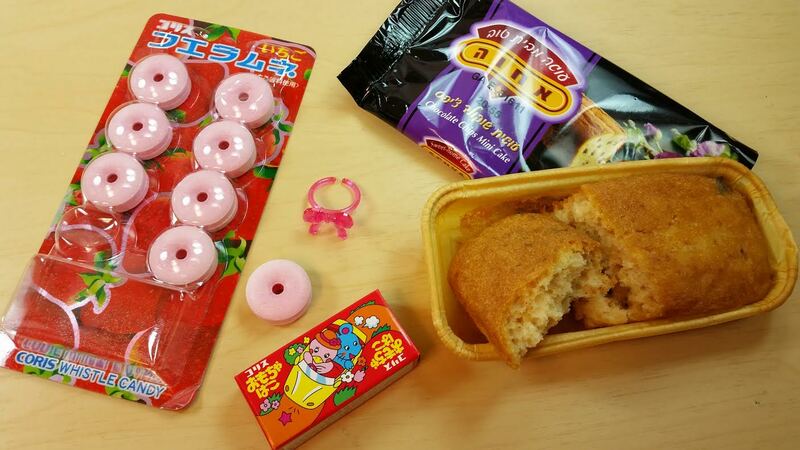 The bonus is a little pink plastic ring with a bow on it. My niece is two and she loves pink. Anything pink. This probably will be way too big for her and probably will break in a second but it's pink so I'm giving it to her. Achva Chocolate Chip Mini Cake- Or more like a mini loaf. A loaf of chocolate chip cake. This is also an Israeli brand and is kosher and pareve and all that. It's... okay. I mean, it's not a super moist and amazing and it's not super flavorful but if you're starving, you're totally going to eat and be like "Wow, that's the best thing I've ever eaten." But only if you're starving. VERDICT: This MunchPak Mini was totally awesome! It had a whole roll of my favorite Hi-Chews! I thought it was a fun mixture. Mostly sweet but with some savory tossed in there. And such a wide variety of the sweet sector. Cake to candies. Pretty good selection if you ask me. I think it's worth the $10 especially with free shipping. And even though it came in an envelope everything arrived perfectly. The crazy thing is that MunchPak allows for a ridiculous level of customization. 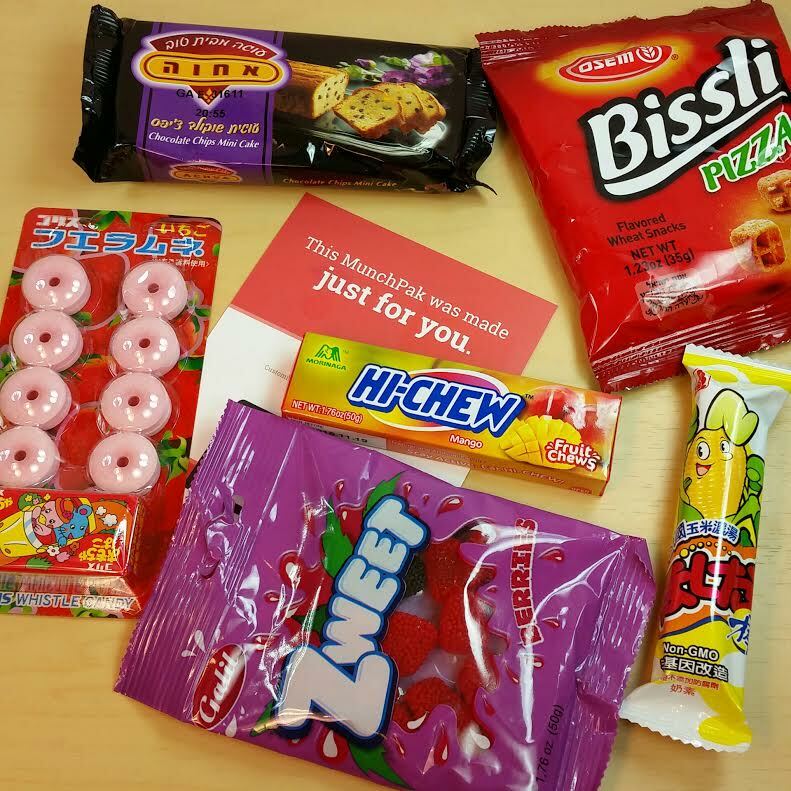 I mean you can request to receive (or not receive) salty or sour or only American snacks along with a host of other things. It costs $1 per customization. There is not currently an allergy customization but you can request snacks with no nuts. You can also add a drink type to your box for $5. Not only that but you can request to get a box a week. Or a box every two weeks. Not just once a month! Even better? MunchPak ships worldwide!! I'm not sure what added shipping costs there may be but there you go! If you would like to sign up for MunchPak, you can do that right here. Make sure to use a coupon. I have two: SNACKIN gives $2 off and INSTA3OFF gives $3 off. Oh, and when you first hop on to the website, there might be a popup that will give you $5 off your first box if you put in your email address. I totally did that, I want another box! Have fun! *affiliate links were used in this post. This box was sent to me for review purposes. No compensation was received and all opinions are entirely my own.